BOSTON (AP) The Boston Celtics needed all of 12 seconds to take the lead over Charlotte and continued to pull away from the Hornets over the next 47 minutes. ”I thought we played with force. I thought we executed well. But that was just one of those nights where you had great, great shot-making,” Boston coach Brad Stevens said. The Celtics made 54 of 87 shots (62.1 percent), their best shooting performance since hitting 60 percent against Orlando on Nov. 11, 2013. Kyrie Irving led Boston with 34 points, making 13 of 18 shots overall and going 4-for-6 from 3-point range in the first three quarters. He and the rest of Boston’s starters let the Celtics’ reserves take it from there. After riding a three-game skid into the All-Star break, the Celtics surged through the end of February and averaged 119 points while winning four straight. Aron Baynes had 12 points and 10 rebounds and Jaylen Brown scored 15, including nine in the third quarter as the Celtics turned the game into a blowout. Terry Rozier and Greg Monroe scored 14 points apiece for the Celtics, who had seven players score in double figures. Charlotte didn’t have much luck, either, in the third period. Irving barely beat the shot-clock buzzer with a turnaround jumper that put Boston up 86-67 with 6:29 left in the third, and bounces continued to fall for the Celtics. Brown missed an opportunity for a three-point play with 4:45 left in the third, but got a second chance at the free throw when Charlotte was called for a lane violation. Brown hit the second attempt and Boston’s lead was 94-67. 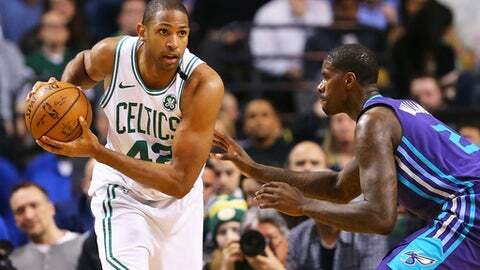 The Celtics reached 100 points with nearly two minutes still left in the third quarter and didn’t let up in the fourth, when the reserves for both teams played the last 12 minutes. Howard said Irving – who scored 16 in the first quarter – had it too easy against the Hornets’ soft defense. Hornets: At Philadelphia on Friday. Celtics: At Houston on Saturday night.